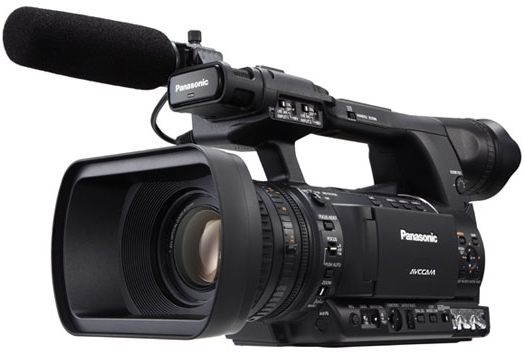 Lease the Panasonic AG-AC130APJ through Panasonic's 0% Interest Lease Program: Panasonic is offering 0% financing for 12 months on their professional video and display products with 90 day deferred payments for sales equal to or greater than $20K. The AG-AC130A AVCCAM HD handheld camcorder offers a high-sensitivity 1/3", full-HD 2.2 megapixel U.L.T. (Ultra Luminance Technology) 3-MOS imager to capture native 1920 x 1080 or 1280 x 720 AVCHD utilizing the MPEG-4 AVC/H.264 codec. In addition, the AG-AC130A features Turbo-Speed One-Push Auto Focus to focus on objects in less than 0.5 seconds, and Expanded Auto Focus Assist that enlarges the center of an image. Both advanced functions enable quick and accurate focusing. Weighs just over 5 lbs. Offering high-quality HD recording utilizing MPEG-4 AVC/H.264 high-profile encoding, the AC130A records video in four professional AVCCAM HD recording modes at 60Hz, including the highest-quality PH mode (average 21 Mbps/Max 24Mbps), the HA mode (approx.17 Mbps), the extended recording HE mode (approx. 6 Mbps), and a PM mode (approx. 8 Mbps, 720p only). The AC130A is also able to record 480/24P and 480/30p.